On first impressions, Ella reminded me of a ski resort. It has that same feeling of energy and excitement, teeming with people who are there for the same reason; to relax in nature, go hiking and to drink up the fabulous scenery that Ella gladly provides. 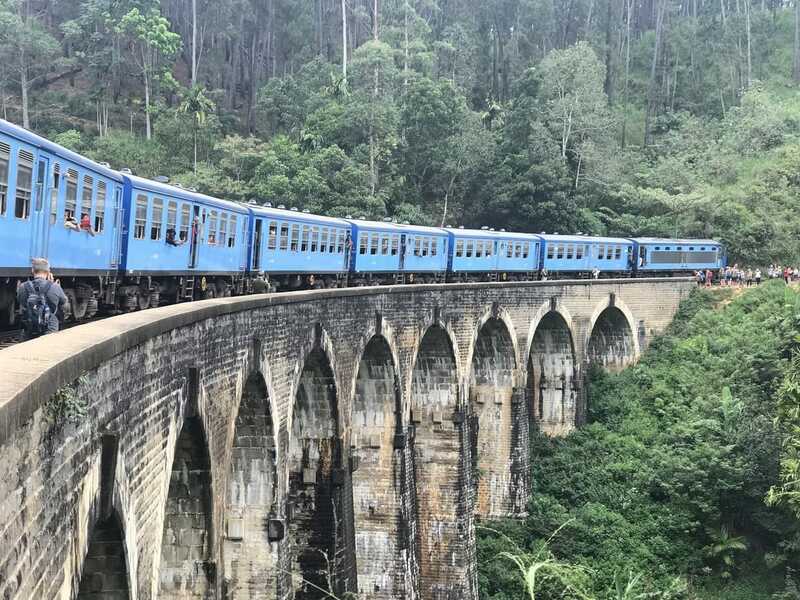 If you are planning on travelling by train from Colombo to Ella (as we did) then book your tickets online through 12Go Asia. This will save you the hassle of having to line up in Colombo and trying to beat the crowds. I am only recommending this company because we have used them a lot in Asia, and their customer service is worth the few extra rupees that you will pay by trying to book the tickets yourself. When you arrive by train into Ella (which is, in my opinion, the best way) you will walk down the hill into the town. Immediately you will be met with laid back ‘all night bars.’ But not those kinds of bars; no, these are classy – subtle and chilled. We are travelling with kids, so there wasn’t much chance of us going for an all-nighter, but still, we took them into one of the bars and had a look around. Just to see what we were missing out on. The bar just down from station plays laid back jazz and soul music, there is a bar downstairs, but when you go up the wooden steps, you are faced with a huge area filled with bean bags, sofas and floor cushions. There are fairy lights and candles. If we hadn’t had the kids – and we hadn’t been on such a tight budget – this is where I would have spent a few hours each evening watching the sun go down with a glass of cold beer. I’m a wine drinker really, but wine made itself very scarce to me in Sri Lanka – one of the many things that surprised me about Sri Lanka. We visited Sri Lanka for a month in January. The weather was beautiful. We spent a couple of weeks soaking up the sun on the beautiful Mirrissa beach and then went touring the country by train for the duration of the trip. We were in Ella for four days. Two of those days were filled with activities, and the other two were spent chilling at the homestay, soaking up the Sri Lankan beauty and relaxing. I’ll tell you about our homestay in a tea plantation later in the post, first, let me inform you of what there is to see and do in Ella. You can’t visit Sri Lanka and not have heard about trekking to Little Adams peak in Ella. Even I’d heard of it and I don’t know a lot about anything. Little Adams peak is the nephew of big boy Adams Peak (Adams Peak being situated between Kandy and Ella – about 4 hours by train from Ella). To be fair; it’s a bit ambitious to say Little Adam’s Peak is a ‘hike’. 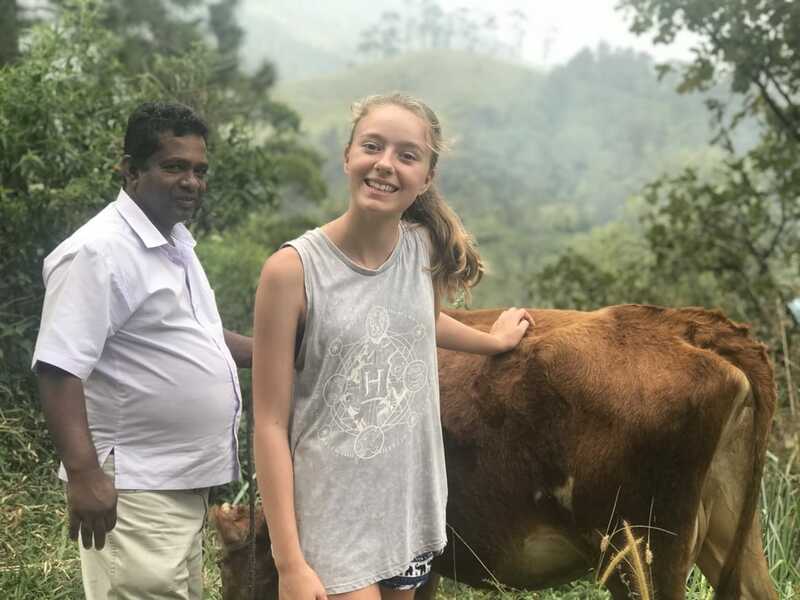 It’s more like a very energetic Sunday romp, but, as we were travelling with two teenagers we decided that little Adams Peak would suffice in the trekking department and my teenagers would feel better if we said that they had been hiking. Give them a bit of street cred. Walk down to the main town centre of Ella and head for the bottom of the hill. You can ask anyone, and they will give you directions, it’s straightforward to find. At the bottom of the hill, there is a junction, and you will see a sign for 98 Acres Ella. Follow the sign. You will go past a supermarket on the right-hand side, get some water and maybe a few snacks for the hike – you are going to need it, especially if it’s hot. Before you turn to follow the sign up the hill, there is a cafe restaurant on the righthand side. It’s called The Ella Flower Garden Restaurant. Don’t be put off by the fancy exterior, the prices are reasonable. Stop here for a cup of tea or a beer — the views from the garden are out of this world. After you have had your share of tea and cake start come out of the cafe and turn right, there is a white Buddha at the entrance to 98 Acres resort, look for this – it marks the access to where you want to be heading. 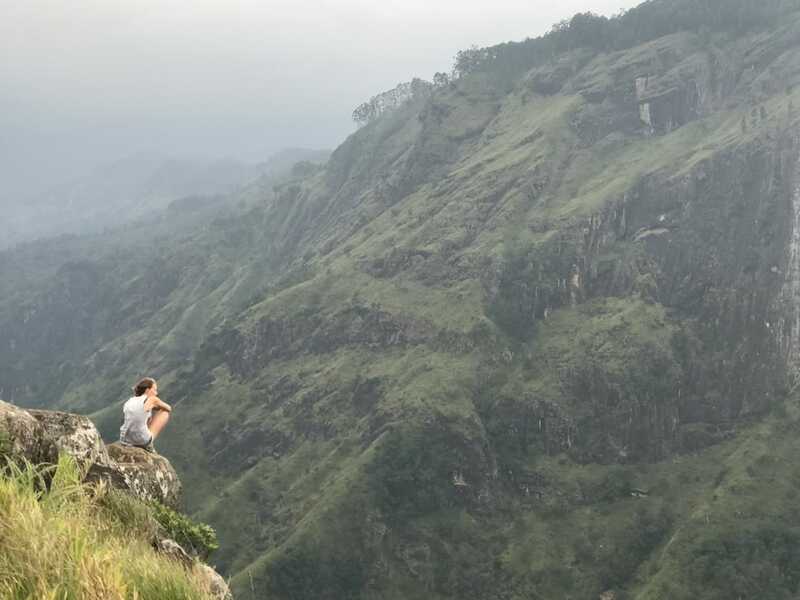 How Long Does It Take To Climb Little Adams Peak? Allow a good three hours, only because when you get to the top, the views will entice you to stay. Don’t rush this; it is easily one of the most fabulous walks I have ever been on. When you get to the top, you feel as though you are flying. It is breathtaking. The Weather in Ella Sri Lanka. We travelled throughout Sri Lanka for the whole of January. The temperature stayed at a constant 30 degrees which were perfect. Not too hot, but hot enough to feel as though you were somewhere exotic! The weather on the day that we chose to climb little Adams peak was rather grey and overcast. It was perfect in the sense that it wasn’t blistering hot, but unfortunately, our photos weren’t very Instagram worthy. Despite the cloudy weather, it didn’t stop us taking out our drone and flying it. We waited until the crowds had moved away and then used our drone to capture some spectacular photography. You are supposed to have a drone license in Sri Lanka, but we only found this out later on. We were stopped by the police for having a drone in Sri Lanka; Ill tell you about later in the post. 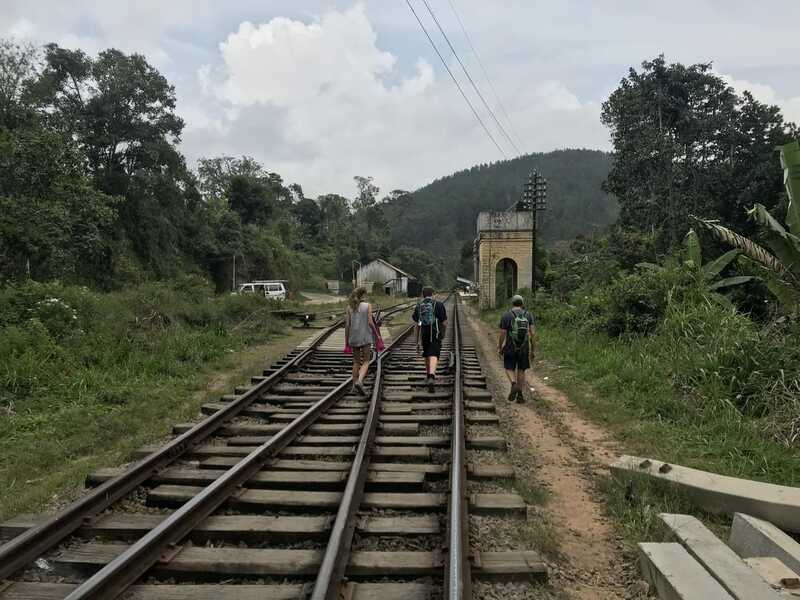 On day two of our visit to Ella we got up early and walked to see the famous Nine Arch Bridge in Ella. There was no way I was going to come to Ella and not get at least one photo of this iconic bridge for my blog. There are a couple of ways that you can reach the bridge, I’ll tell you our way. It was the most adventurous. Go back to the railway station and with the town of Ella to your back, turn right. Start walking. Ignore people who say you aren’t supposed to walk along the tracks. This is Sri Lanka. Everyone walks along the railway tracks. There is a grass verge along the edge so don’t worry; you won’t get squished if a train comes along. 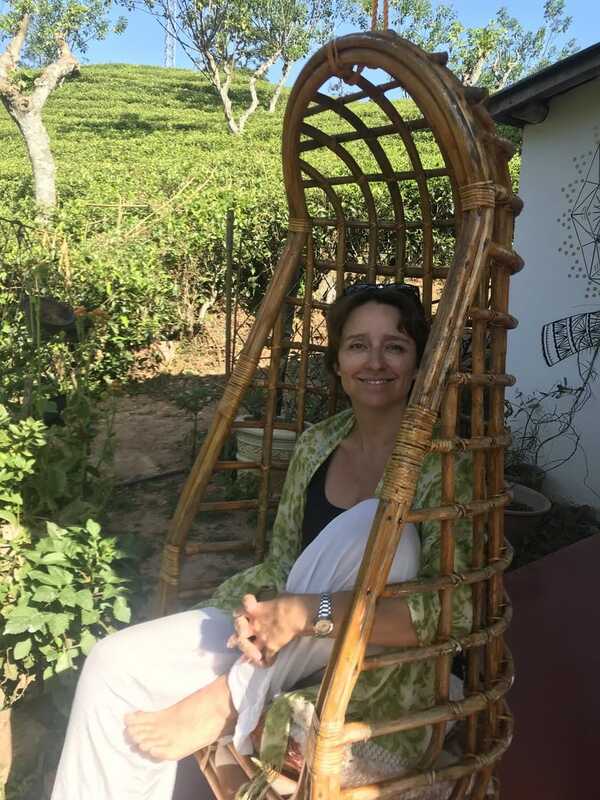 As is always the case in Ella, the views are beautiful; you can see tea plantations and farms and you pass locals who are always happy to sit and have a chat with you. Especially about the cricket if you happen to be from New Zealand Like us. 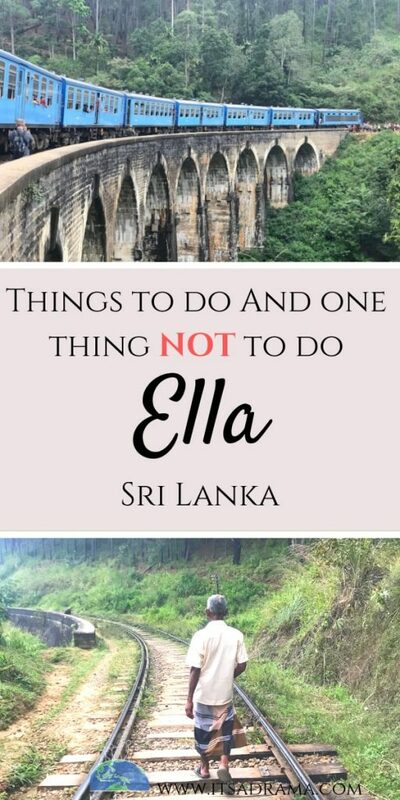 What NOT To Do In Ella Sri Lanka! I promised I’d tell you about our run-in with the police and so I will. When you walk along the train tracks towards the nine arch bridge, just before you get to the bridge itself you walk through an amazing tunnel. We thought it would be super cool to fly the drone through the tunnel and then film the bridge as though we were on top of a train. I know. Creative aren’t we? Little did we know that there were two policemen at the end of the tunnel and as soon as they saw our drone they went slightly crazy. They ordered us to bring the drone down and then told us to wipe the footage. It was all very dramatic and YouTube worthy. Of course, we did as they said, we weren’t about to get ourselves into hot water with the Sri Lankan police and I wouldn’t recommend you do either. The annoying thing was that when we walked over to the far side of the bridge, there was a big group of people with drones. They had waited until the police went on their tea break and did some filming. We were too scared to join in given what had just happened, but in talking to the drone flyers afterwards, they told us that you are supposed to have a drone license. Drone or no drone, do not miss the opportunity to walk the train tracks to see Nine Arch Bridge. It was one of the highlights of our stay in Ella. Taking a sleeper bus in India. Hell on earth. Cost to travel the world – 4 months in. Where To Stay In Ella Sri Lanka. You are going to thank me for this little tip. I believe that we found the best place to stay in the whole of Ella. As I explained to you earlier, we are on a year-long backpacking trip with two teenagers. It’s incredible, but exhausting at the same time. When we arrived at the Tunnel Gap Homestay, I felt as though we had gone home for a couple of days. Here you will find the BEST homestay in Ella, Sri Lanka. Do you like the way I matched my scarf to the tea plantation?! The lady who owns the honesty is just lovely. She recently won some award for being the most helpful host in Sei Lanka. You’d have to talk to her about that, she told me the details, but I can’t remember exactly what it was and I don’t want to get it wrong. The homestay is up a steep driveway. Be warned. When I say steep, I mean steep! Think of what it’s doing for your thighs, and it will make you feel better. Once up the driveway, you are rewarded with a beautiful homestay with the most fabulous views of the Ella Valley.. There is a verandah where you sit and take breakfast and watch as the tuk-tuks meander their way up the steep hill opposite. To the right of the homestay is a lush tea plantation and to the back is the railway line. It is simply divine and very Sri Lankan. Don’t be put off thinking that it will be noisy with the trains; it isn’t. They don’t come by that often and when they do you will want to stand and watch them. The food is fabulous (we had breakfast every day and an evening meal once – it was always delicious.) The rooms are clean, and although it was a bit of a squeeze in the family room (two double beds) there is plenty of space outside to relax on the swinging chair or on one of the many benches overlooking the tea plantation. While we were there, my son who is 17 made a video of the homestay as a gift for the owner’s hospitality. I include it here is that you can see for yourselves exactly how wonderful it is. You can check out Tunnel gap Homestay here. You won’t be disappointed. We talked to some travellers in Ella, and it seemed that we got lucky with this lovely find. If Tunnel Gap is full, check out the hotel finder on the map below. And that was our stay in Ella, Sri Lanka. As I said, we spent two full days sitting on the veranda of the homestay soaking up life in Sri Lanka. I think it’s really important when you visit a place to stop and breathe. You can certainly do that in Ella. Nothing feels rushed or touristy; it really is a wonderful, relaxing place to visit. Let me know how your exoerience of Ella was and if you enjoyed The Tunnel gap Homestay as much as we did!